Wide applications of anhydrides for production of dyes, surface active agents, lubricant additives, organic flame retardant materials, esters, flavors & fragrances are increasing the demand for anhydrides across several industry verticals. Moreover, huge demand for anhydrides for manufacturing of polymeric materials, pharmaceuticals and agrochemicals are also propelling the growth of anhydrides market across the globe. Leading market players are investing in acquisitions and product innovations to diversify their portfolio and to expand their business across the globe. For instance, in 2016, one of the leading manufacturers of phthalic anhydride (PAN) IG Petrochemicals Ltd. acquired Mysore Petro Chemicals Ltd’s maleic anhydride (MA) business. Such acquisitions are likely to support the growth of global anhydrides market. As per the Goldstein Research analyst, the global anhydrides market size valued USD 15.4 billion in 2016 and is estimated to reach USD 24.92 billion by 2024 growing at a CAGR of 6.2% during the period 2016-2024. The report covers the present ground scenario and the future growth prospects of the anhydrides market for 2016-2024 along with the total supply, sales and production of anhydrides in every region. We calculated the market size and revenue share on the basis of total sales of anhydrides (by product types) and cost of different types of anhydrides across the globe. Moreover, the report also provides the data of total consumption of all types of anhydrides in every region. On the basis of product type of anhydrides, phthalic anhydride is the dominating segment and the market size valued USD 7.2 billion in 2016. Maleic anhydride market valued USD 3.84 billion in 2016 and is projected to grow at a faster rate during the forecast period. Low cost, less complexities in production and low environmental risk are expected to propel the market growth of maleic anhydride. Anhydrides market Outlook 2016-2024, has been prepared based on an in-depth market analysis from industry experts. The report covers the competitive landscape and current position of major players in the global anhydrides market. The report also includes porter’s five force model, SWOT analysis, company profiling, business strategies of market players and their business models. Global anhydrides market report also recognizes value chain analysis to understand the cost differentiation to provide competitive advantage to the existing and new entry players. Other high-flying vendors in the market are: Mitsubishi Chemical Corporation, Fuso Chemical Co Ltd., Ashland, Flint Hills Resources, Bartek Ingredients Inc., Polynt S.p.A, Zhejiang Jiangshan Chemical Co., Ltd., MOL Hungarian Oil & Gas Plc, Nippon Shokubai Co., Ltd., Changzhou Yabang Chemical Co.,Ltd., Thirumalai Chemicals Ltd., Bluestar Harbin Petrochemical Corporation, Nan-Ya Plastics, Shandong Hongxin, Koppers Industries, IG Petrochemical and ExxonMobil Chemical. 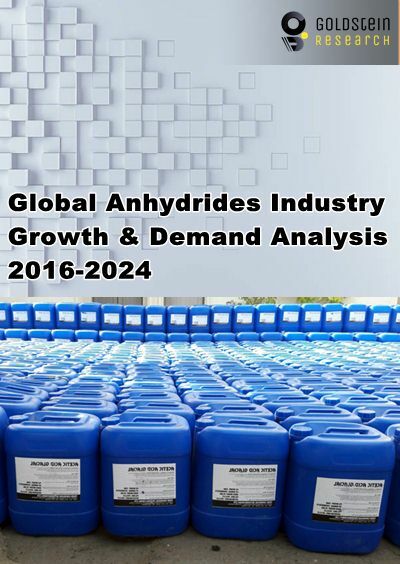 According to the report, diverse applications of anhydrides as an additive in plastics, agricultural chemicals, petroleum, lubricants and oil, paints and coatings and food and pharmaceuticals are major factors driving the global anhydrides market growth. Further, the report states that some anhydrides are highly reactive compounds results in vigorous reaction causing risk for human health. Acute health effects such as skin and eyes irritation and cancer hazards caused by the exposure with acetic anhydrides are inhibiting the growth of acetic anhydrides market. Thereby risk of using anhydrides is the major factor hindering the growth of anhydrides market. Based on geography, Asia-Pacific is the dominating region and occupied 33% share of global anhydrides market in 2016, owing to the presence of large consumer base in countries such as China, India and Japan. Europe is the fastest growing region for anhydrides market and is anticipated to grow at a CAGR of 7.5% during the forecast period. On the other hand, North America is expected to create new business opportunities for anhydrides market in the near future, owing to the rising application of anhydrides in pharmaceuticals, construction and food & beverages industries. What is the projected total market size by 2024 and what would be the expected growth rate of anhydrides market? What are the total exports & imports data of anhydrides in every region and what would be the opportunities over the forecast period? What are the business strategies and risk factors for key market players in this market? What are the government regulatory requirements for anhydrides in major countries? We can provide two hour complimentary interaction with our analyst after the purchase of this market report. Details are imparted within the report.